Randy Johnson's thoughts from 3:17 p.m. to 3:18 p.m. on Oct. 17, 1992: "This is so stupid. Why would the ball get stuck in the bat? Whatever. Just try to keep your mouth closed this time, Randy. Heh, Randy. 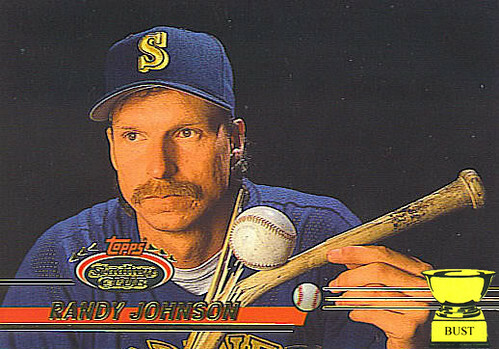 My name is Randy Johnson. Heh, heh. The Big Unit is Randy. Ha! That's funny. Remember that time Buhner gave both the Griffeys a hot foot at the same time? Junior cried like a little girl for, like, two hours! 'Oh, I have sensitive feet!' Ha! What a wuss. I bet I could break his bat like this. I wonder what else I could break with my fastball. Bricks, like those karate guys do? Maybe diamonds! Ooh, I wonder what would happen if I hit a bird..."